Google Maps and Google Earth has changed our perception of what can be achieved with technology being used at a macro level. And then came Google Street View, a technology featured in Google Maps and Google Earth that provides panoramic views from positions along many streets in the world. Bangalore was the first city in India where the search giant first started collecting images in India. But objections by the local police forced Google to wind it up. That was way back in 2011. Google Street View displays panoramas of stitched images taken from a fleet of specially adapted cars. Street View images appear after zooming in beyond the highest zooming level in maps and satellite images, and also by dragging a “pegman” icon onto a location on a map. When dragging the pegman icon, blue lines on the map showing Street View imagery will appear. After hitting roadblocks for quite some time, Google has managed to bring back Street View, though only for monuments as of now. The launch is scheduled for 3rd October at Qutub Minar, New Delhi. Unfortunately, it will be restricted to just a mere 100 monuments as of now. Street View is in collaboration with the Archaeological Survey of India and the Ministry of Culture. It will be restricted to their monuments spread across the country. 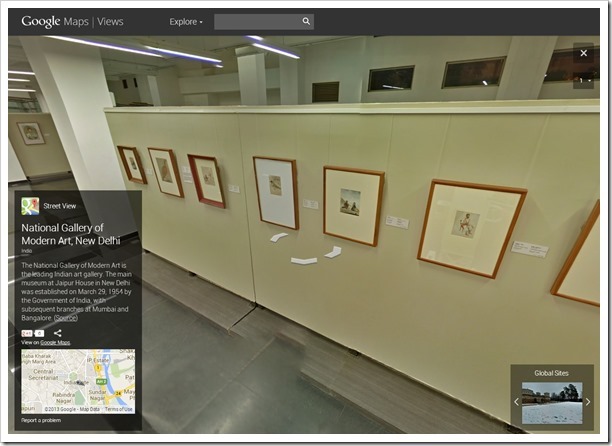 At the moment, Street view in India shows just the National Gallery of Modern Art in New Delhi. Sula Vineyards was the first Indian vineyard on it. It seems it is not just monuments. East India Hotels that runs Oberoi brand of hotels and resorts, is offering a virtual walk through of all properties in India on Google’s Street View. By opening its doors to the company’s specially designed cameras, Google Maps users can now explore 360° images of all Oberoi Hotels & Resorts in India. The hotels that have been mapped are Oberoi Gurgaon, Oberoi New Delhi, Oberoi Mumbai, Oberoi Bangalore, Oberoi Grand Kolkata,Oberoi Cecil Shimla, Wildflower Hall, Shimla and Oberoi Amarvilas, Agra among others. Others may soon join the party. Street View cars are equipped with near-HD cameras and that too on a pedestal. It is akin to a person standing on a ladder and peeping inside your home. The monuments route which Google has taken, pleasing the ASI, Ministry of Culture, Tourism Ministry, and showcasing the private properties (like in Oberoi’s case), is a win-win situation for both. In a country like India, where anti-social elements are more tech-savvy than those in charge of running the place, high tech tools like these can surely fall in wrong hands. How can one forget that during 26/11 the attackers and their controllers were helped more by the live TV coverage than our rescue team? Outdated laws make it all the more difficult to clarify what is private, what is public and what is illegal in such matters. From a pure navigation, entertainment and tourism point of view, Google Street View should be invited and encouraged for all that is public. Slight censorship can solve this simple issue. No Google Street View for Indians; Govt Cites Security Concerns! Hi am from warangal. Warangal selected as streetview pilot project. Streetview lanched 2 months back ago. If you want to find search places (fort waramgal, thousand piller temple,ramappa temple,nit warangal).